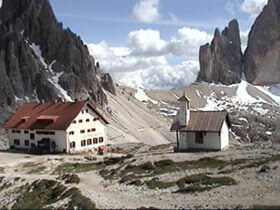 but feel free to contact us for information or questions concerning the Dolomite Mountains. John on the Via Ferrata " Punta Anna"
This will be you on your 4th Via Ferrata Day. The itinerary for each of the activities are available by clicking on the appropriate link on the left. John Resio will be your tour organizer and your personnel guide on your adventure tour in the Dolomite Mountains in Cortina, Italy. Here, you will experience an exciting and exhilarating time in beautiful Cortina. There are video clips on this website to show you what a Via Ferrate climbing trip is all about. 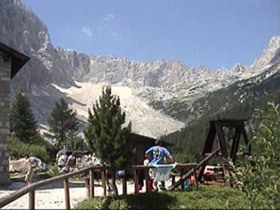 There are also clips of your hiking adventures and panoramic views of the Dolomite Mountains, etc. New' (Women's Travel) - One week in July is set aside for women only. You can take the hiking or the (Via Ferrate) climbing tour in either the 3 star or 4 star hotel. Starting date 6-July ending Date 13-July (See Prices & Dates page for more info. 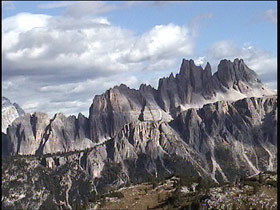 The movie "Cliffhanger," starring Sylvester Stallone was filmed in the Dolomite Mountains. Ferrate Tours - Such a monumental adventure - you must contact us now!you must contact us now!